Are you still hesitating to go camping with your baby? Too complicated you think? Not necessarily! Here are some tips for spending your first camping holiday in Brittany with your baby. With CAMPING PLUS, camping with young children is child's play! Many of the mobile homes offer home from home comforts and feature a master bedroom which can accommodate a cot. You also have at your disposal a microwave oven to warm up small jars and bottles. And, when you rent a mobile home with a covered terrace, your baby can stay well out of the sun to take a nap or daydream in his baby seat. Camping in a tent with a newborn baby is maybe not the most suitable option. It is best to wait until your baby is 15 months old. However, you could be tempted by the Lodge tents, Coco Sweet or canvas bungalows. This comfortable, fun accommodation is a mix between a tent and a mobile home. Yippee! Your little darlings are having heaps of fun ! How do you make your little ones happy? By choosing a campsite with a waterpark and... paddling pool! Ideal for toddlers to cool off and splash around safely in shallow water. In Brittany, almost all campsites have a waterpark with small slides, water fountains, sprinkler mushrooms and other water games... If you add to this a nice playground, a kids' club, activities specially adapted for toddlers, or even a mini-farm as there are on some Breton campsites, the holiday takes on a whole new dimension for children! The vast majority of campsites in Brittany offer baby kits for families: changing table, baby bath, highchair, cot, laundry area with washing machine and/or tumble dryer for daily laundry of bibs and babygrows, bike hire equipped with baby seats... There’s everything you need so you can travel lightly! 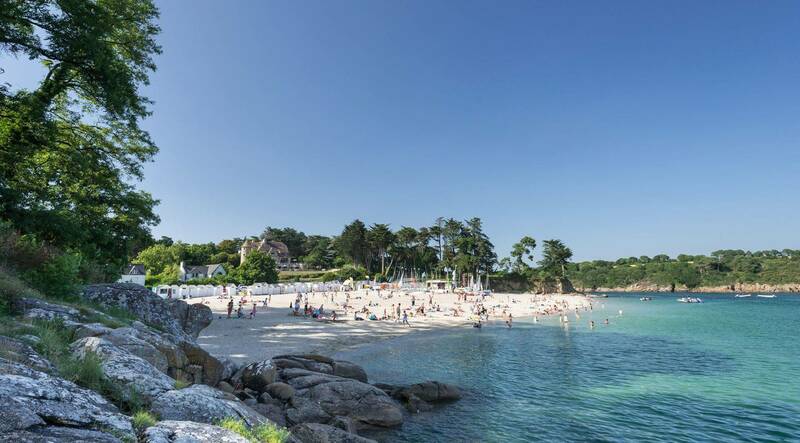 Brittany is an ideal destination in summer with a baby. Unlike some regions in the South of France, it is never scorching hot. The small sea breeze brings a little freshness, which is much appreciated when camping with young children.